The Numerous Cinnamon Health Benefits! Its sweet fragrance and unique flavouring are some of the reasons for its prized status, but another strong selling point has always been the cinnamon health benefits. As one of the world’s oldest and most beloved spices, it has been used in Egypt since the time of the Pharaohs. It's chronicled in the Bible, and was offered as a gift to the gods in ancient Greece! The Many Cinnamon Health Benefits! Cultivated from the bark of the cinnamon tree, it's been prized for thousands of years for its medicinal value. However, it's only recently that we've been able to test its effects, and validate the science behind the folklore. The main types, Ceylon, cassia and Saigon, are all known to be high in antioxidants, and rich in a number of chemicals with promising well-being possibilities. Note: Whilst all have therapeutic effects, it's thought that Ceylon is the most useful. One of the most unusual things about this treasured spice is that even its odour seems to be beneficial! Recent studies have shown that just the sweet and spicy smell can help improve mental performance and memory. The Medicinal Cinnamon Health Benefits! ...In traditional Ayurvedic medicine alone, Indian practitioners have more than 600! Including ways of healing diarrhoea, heart disease, coughs, headaches and fever. Research has shown it may even help with weight loss! In Pakistan, a study found that diabetics given 1 gram every day saw a significant decrease in their high blood sugar levels, their cholesterol levels and their triglycerides. It can help you stop smoking! Maybe! The National Institute of Health has found that this spice is a powerful tool in helping people quit smoking. 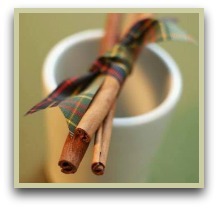 ...sprinkle a little on your oatmeal or toast, or even use a hint to flavour coffee or make a tasty cup of cinnamon tea? Click here for my tasty tea recipe. Turmeric Health Uses - Definitely a Super Spice!